There are times when you really do need a big van… and more besides! If your job requires bulky equipment and lots of different tools and utensils, and if everything has to be kept tidy to stop it getting damaged or tangled up, as happens so easily with hoses and cables, then not even the biggest van is enough on its own. The only answer is to install a custom racking solution. Let’s have a look at a van operated by a small business that specialises in irrigation systems for parks and gardens . These systems, which obviously have to be installed on the customer’s land, consist of a large number of parts and require a whole range tools to install. The photos below show a Volkswagen Crafter equipped for an irrigation service . The Syncro System storage solutions and accessories installed inside are designed to transport everything needed to install, connect and operate irrigation, pumping and water distribution systems. Let’s examine the linings and cabinets that Syncro’s specialist installers chose for this job. 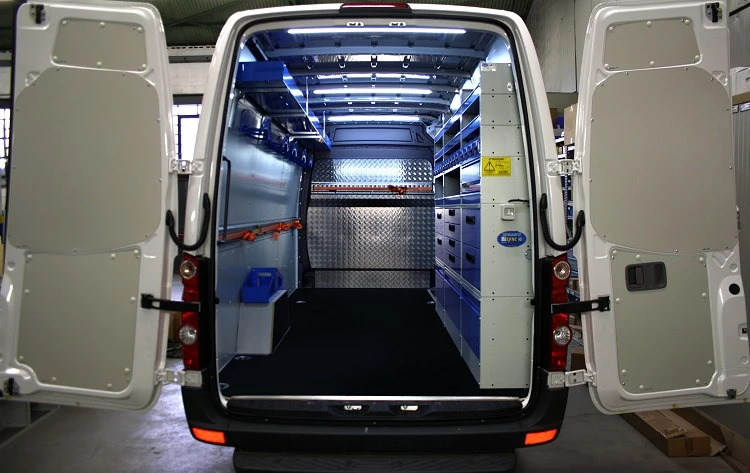 Syncro racking installers always start by lining the interior walls of the van’s load compartment and covering the floor with a robust plywood panel capable of withstanding heavy loads for many hours a day. This far-sighted precaution prevents damage to the interior of the van body and preserves its original condition for years to come. In the case of this Crafter, used by a company that installs and services irrigation systems, the floor was covered with a resinated plywood panel for strength and resistance to wear, damp and accidental spillages of water and other liquids. The side walls and doors were lined with pre-painted aluminium panels, while the bulkhead was protected by a sheet of aluminium tread plate. A generous amount of space is dedicated to cargo lashing accessories. There is also plenty of open and closed storage for small and medium items, plus essential cleaning and first aid accessories. A long cargo rail with lashing straps. This allows even large objects to be carried on the floor and secured by straps around their middle to stop them sliding about during transport. 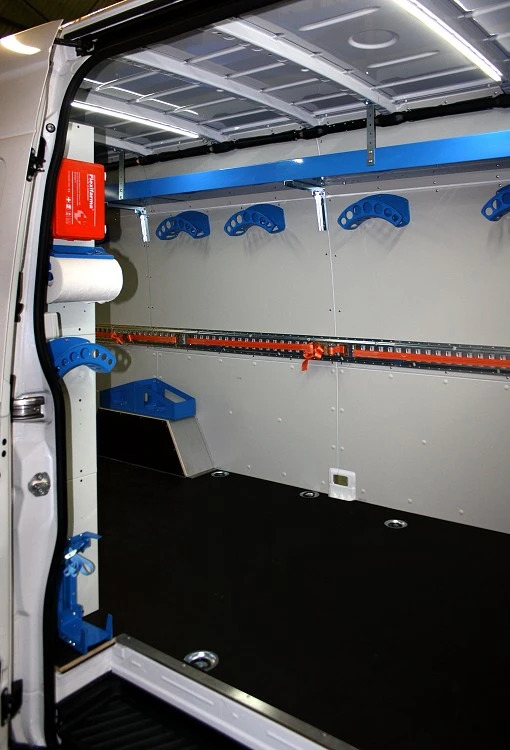 The space above the wheel arch unit has been fitted with two holders for plastic or metal canisters containing liquids such as oil. 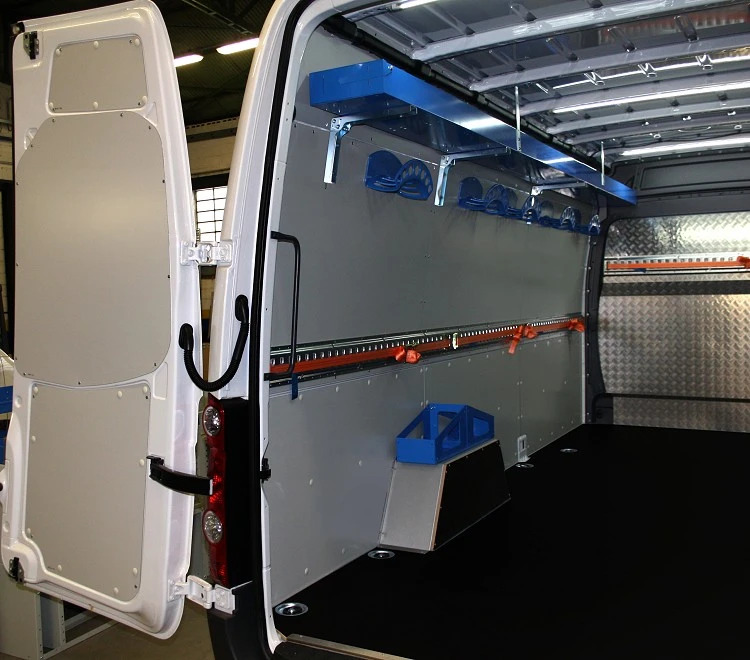 To exploit the height of the van body, the top of the left wall has been fitted with a tray that is open at the rear and extends the full length of the wall. In this way even long pipes can be carried with ease. Under the top tray we have five holders for long coils of electrical cable, extensions and hoses, with straps underneath to keep them secure and tidy. The bulkhead has been fitted with another lashing system consisting of a rail and straps arranged at exactly the right height to hold spades, shovels, rakes and other long or tall implements. The racking along the right wall provides storage for delicate items of equipment that need to be stowed in closed containers, and for all the fasteners, spares and sundries needed to install irrigation systems. Over three closed wheel arch units we can see a cabinet with different size metal drawers, all with anti-slip mats and dividers inside. The top section consists of a shelving unit with open shelves, one that can be closed by a door and another dedicated entirely to a series of removable plastic containers. The end of the cabinets near the van’s side door has been equipped with a fire extinguisher support bracket, a cable holder, a paper roll holder and a first aid kit. The entire load compartment is brightly but pleasantly illuminated by three compact, low consumption, LED roof lights that can be operated from a switch on the right side. 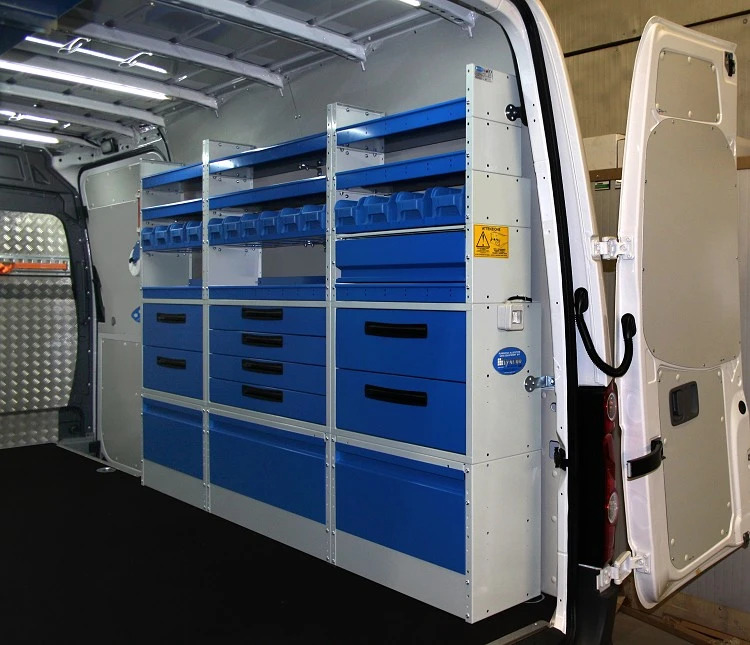 A storage solution in a VW Crafter used to install and service garden and green area irrigation systems.